Duke Is Wake-up Call for Research Compliance (bna.com April 4, 2018) The case is in the discovery phase in preparation for a possible trial, according to filings tracked by Bloomberg Law. Judge Refuses to Dismiss Whistleblower’s False Research Data Suit Against Duke University and Two Faculty Members (The Health Law Firm Thursday, May 11, 2017) On April 27, 2017, a federal judge in North Carolina refused to dismiss a False Claims Act (FCA) lawsuit against Duke University and some of its faculty. Survival of Duke Research Whistle-Blower Case Could Mean More Suits (bna.com May 2, 2017) Duke University and two Duke researchers will have to face claims they defrauded the government on NIH research grants ( United States ex rel. Thomas v. Duke Univ. , M.D.N.C., No. 1:17-cv-00276-CCE-JLW, order 4/25/17 ). 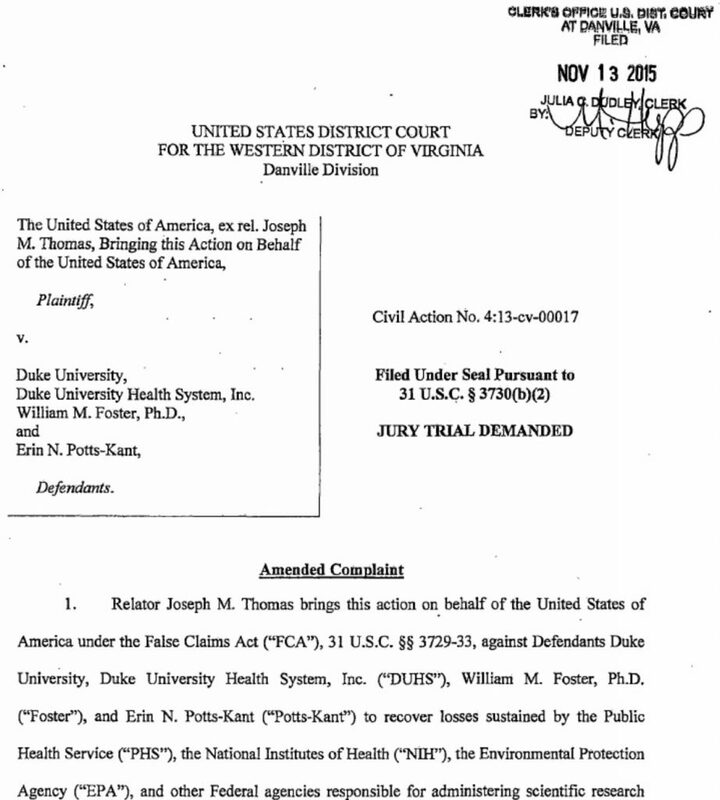 Former Duke University employee Joseph M. Thomas sufficiently stated claims against Duke and the researchers, Judge Catherine C. Eagles of the U.S. District Court for the Middle District of North Carolina said in an April 25 order refusing the defendants’ bid to dismiss the suit. False Claims Act （Wikipedia): The False Claims Act (31 U.S.C. §§ 3729–3733, also called the “Lincoln Law”) is an American federal law that imposes liability on persons and companies (typically federal contractors) who defraud governmental programs. It is the federal Government’s primary litigation tool in combating fraud against the Government. The law includes a qui tam provision that allows people who are not affiliated with the government, called “relators” under the law, to file actions on behalf of the government (informally called “whistleblowing” especially when the relator is employed by the organization accused in the suit). Persons filing under the Act stand to receive a portion (usually about 15–25 percent) of any recovered damages. As of 2012, over 70 percent of all federal Government FCA actions were initiated by whistleblowers.